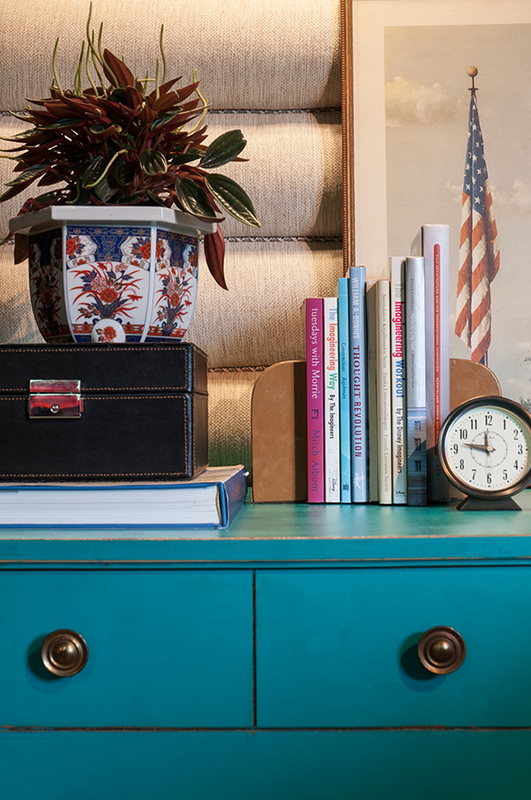 Local design talents showcase their personal style in their eclectic city home. The homeowners found the vintage sideboard and hutch on Cherokee street and knew it needed to find a place in the home. The statement chandelier was an experiment the designers took a chance on. Originally from the '80s, they removed the glass and added rope detail to modernize the fixture. 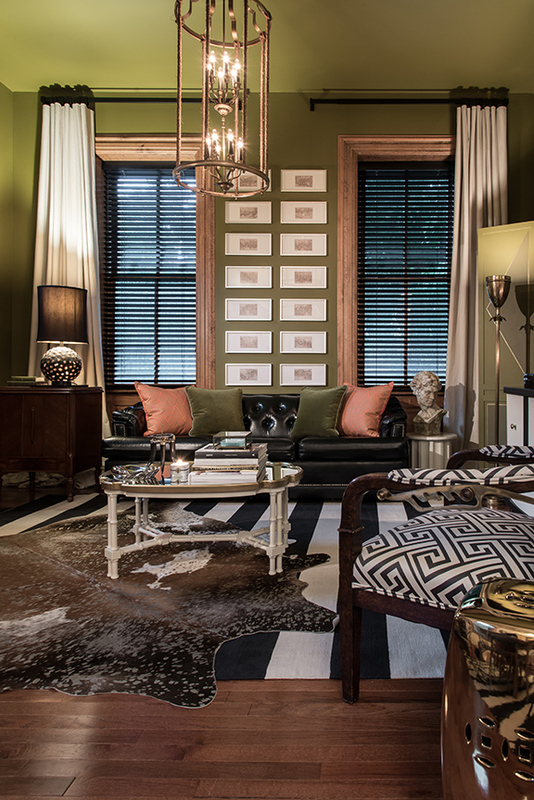 A bold, dramatic shade of green dominates the walls and ceiling in the living room. The unexpected color choice turns the focus to the lighting, artwork and furnishings. 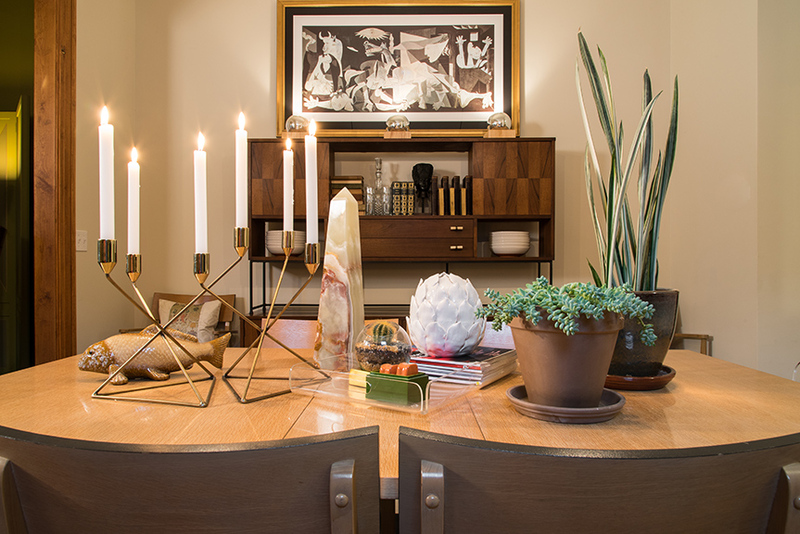 The dining room tablescape shows the eclectic mix of styles the designers try to showcase in their home. Neutral furnishings, like the wall-to-wall upholstered headboard, and pops of red offset the navy blue saturdated walls in the master bedroom. 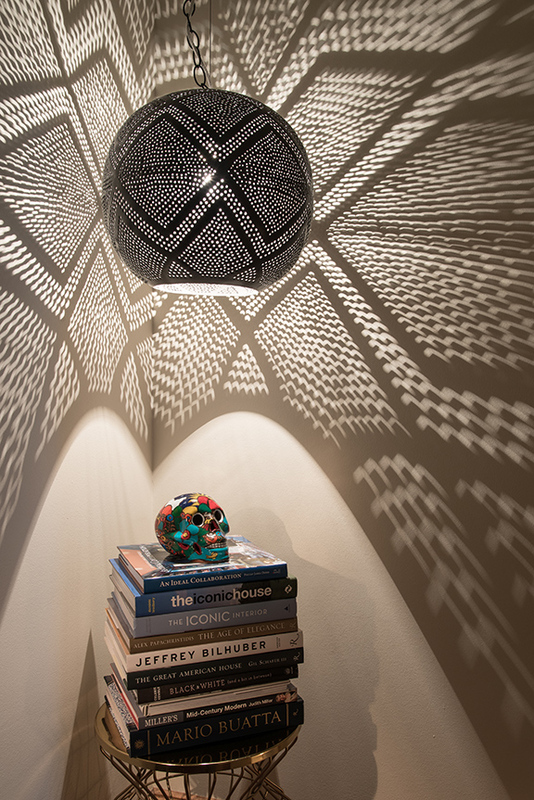 Hanging at the top of the stairwell, the funky light fixture creates a constellation effect on the walls creating a special moment that makes the designers stop and smile as they walk by. 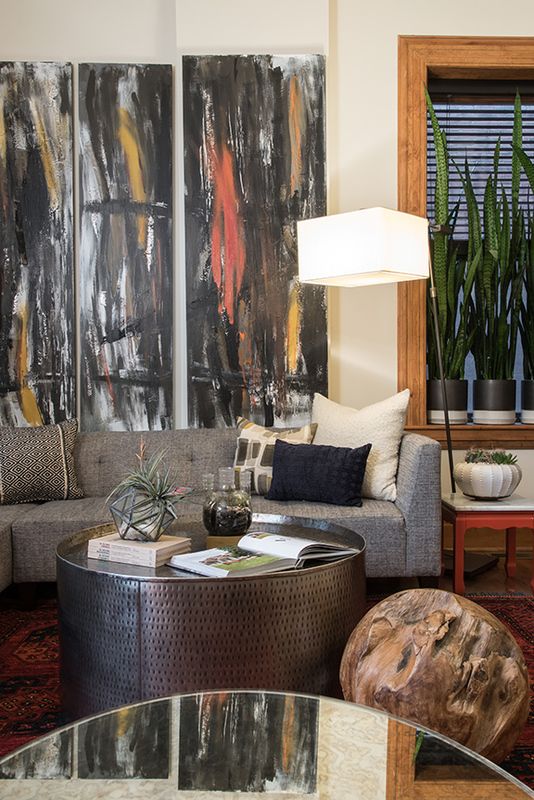 A mix of mustard gold, oranges and reds, the abstract artwork, painted by Mike, is a very personal touch the designers worked into the family room. 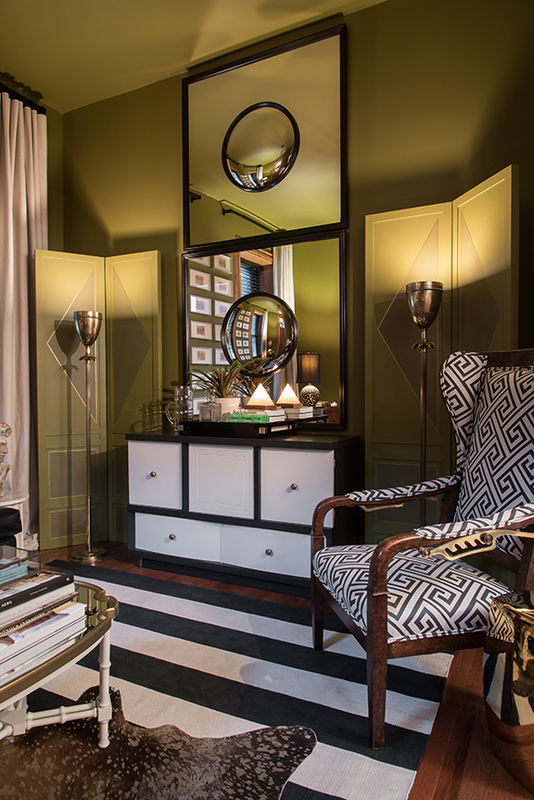 For local interior designers Michael Wyrock and Justin Maine of Nistenhaus Design, the design process is more than just picking paint colors, furniture and fabrics. Their main objective, whether in a client’s home or their own, is to create a comfortable environment that reflects the homeowners’ personality. The question they constantly pose is what do you want to put in the space and how does it make you feel? After renting in Old North in St. Louis, Michael and Justin were eager to find a home to own and rehab. Their search became frustrating, as the right property just wasn't turning up. After expanding their area, they walked into the front gate of an already rehabbed home right off Cherokee street and Mike instantly fell in love. After walking through the front door, Mike says he thought it was even cooler. “Most of the hard work was already done, and the development company did a great job creating an open concept layout,” Mike says. “Even though the home had been renovated, there were still a lot of historic elements that feel traditional in some ways, but modern in others,” Justin adds. The couple ultimately purchased the property because they spend a lot of time in the Cherokee area and love the eclectic, urban feel. “We saw ourselves in this neighborhood more than anywhere else we had seen so far, plus it was a cool house to boot,” Justin says. With the dirty work already done for them, Justin and Mike spent their first few months painting, changing out lighting and reworking the layout of the home to configure it in a way that made most sense to the way they lived. After getting the layout set, the design duo layered their treasured pieces in each space to reflect their personal styles. "The style of our house really is an eclectic mix between traditional and modern,” Mike explains. He is more drawn to the modern end of the design spectrum, while Justin favors a more practical and traditional realm. To bridge the gap between the two styles, the designers brought in collected furnishings and accessories. Over the years, they have curated a collection from family and travels. “We like to visit showrooms and designer studios whenever we go to a new city,” Justin explains. “We try to find objects we love and work them into our house while still looking functional and usable.” Before purchasing a piece, they ask: Is this going to work for us in five, 10, 15 years? What can we bring to the house that jives with our style but can also be incorporated into the next place? The synchronization of the design elements in each space drove the design decisions. Justin and Mike selected the palette of furniture, rugs, artwork and accessories for each room before deciding on a paint color. In the living room, a bold, dramatic shade of green dominates the walls and ceiling. An unexpected color choice when entering the home, matching the walls to the ceiling gives an interesting effect by turning the focus on lighting, artwork, etc. “The color becomes a really warm envelope for the other pieces to speak more than the walls and ceiling,” Mike explains. Each piece in the living room has a history to it. The leather sofa, for example, belonged to Mike’s great-grandparents and was in his grandfather’s den when he was growing up. 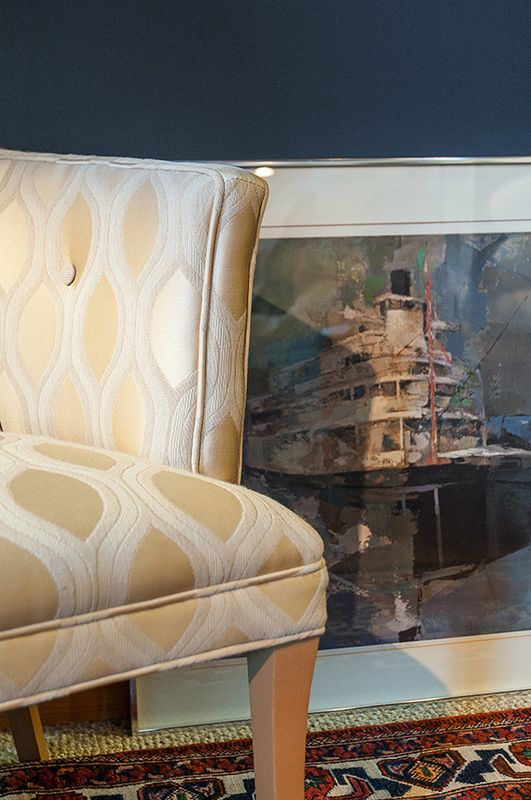 The recliner was a find from Chicago that the designers fell in love with for the shape and brass detailing. “We are constantly thinking, ‘what does this next piece bring to the room'," Justin says. The statement chandelier hanging in the entry… that was a total experiment the designers admit. Originally from the '80s with glass prisms, it was the right shape and size, but the wrong style. They removed the glass, got rid of the shiny brass finish and added the rope detail, making the fixture more modern. 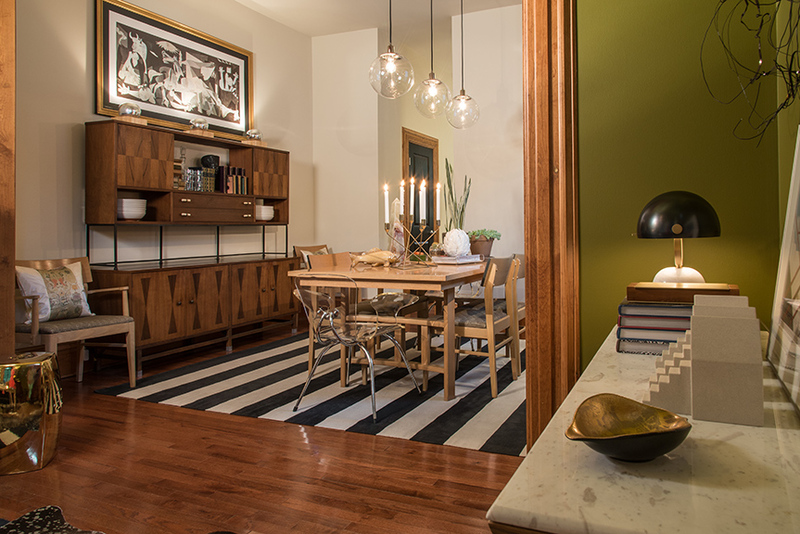 Another modern element, the black-and-white bold striped rug was necessary to balance the more traditional elements in the space. With a hide layered on top, the rug is perfect for an entry. The designers decided to use the same rug in the adjoining dining room to extend the living space making it feel larger. A vintage sideboard and hutch from Cherokee street was a find they knew needed to immediately find a place in their home, and it houses glassware and plates that Mike likes to collect. Mike and Justin were very careful in how they organized the dining room. None of the walls were centered, so it took a conscious effort to hang the three pendant lights over the dining table. Connected to the dining room through the kitchen, the family room is where Mike and Justin spend the majority of their time, yet they say it is the space they’ve given the least design attention to. “It’s a functional space,” Mike says. The sectional needed to fit as perfectly as it could to optimize seating. The low lines of the back of the sectional line up with the window framing. The designers chose a neutral color scheme for the furnishings to build a more subtle color scheme around the artwork, which is an abstract mix of mustard gold, oranges and reds. Painted by Mike, the artwork is a very personal touch in the space, and Justin says is a nice reminder of their time in the city. 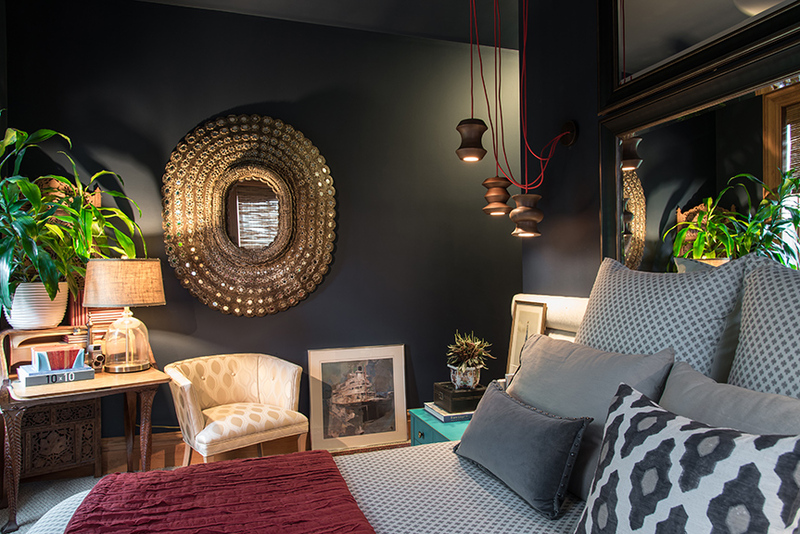 Stepping into Mike and Justin’s eclectic abode, it is clear that each has a discerning eye for color, texture and space. When joined together, they are a dynamic design duo vested to make a home a nested version of its inhabitants, whether it is a client or themselves. “It’s all about getting the best version of design for your family,” Justin says with a satisfied smile.